The Lord of the Rings has universal appeal. There is no doubt about this fact. It has sold over 100 million copies world wide since 1954 when it was published and has been translated into more than a dozen languages. The popularity and readership of the Lord of the Rings of many generations has led to it being voted 'Best book of the 20th Century' in several polls in the UK. This popularity and widespread readership around the world was confirmed recently with the release of the three movies of the Tolkien trilogy, and has further entrenched the book in modern phenomenon. This acclaim can be attributed to many aspects of Tolkien's novel. It is the story of a courageous quest imbued with love, sacrifice, and hope. Being shot through with a nostalgic longing for things passing and noble and being set against amazing landscapes and sweeping vistas gives Tolkien's masterpiece a deep grandeur and awe. Added to these attributes is a depth of culture, peoples and history that make the Lord of the Rings a veritable piece d'art. But what is new about this? Not a lot. Throughout history, many cultures, especially those of Nordic influence, have contained stories and tales of heroic characters on hopeless world saving quests. In fact, as is mentioned later, Tolkien drew from these stories. But what makes Tolkien's lifework so different and enduring? There are other reasons, but what Tolkien has so inspiringly and masterfully brought to life, is a story where the characters and creatures, belonging to a world in peril, fight for their freedom and existence in a noble, just and holy way. The principle characters display an integrity, and selflessness that reminds and points us to the goodness and truth we are all called to live. This, among others, is one of the many draw cards that people find so endearing about the Lord of the Rings; it speaks with a language of valour and hope to a divisive and unforgiving modern world. It is interesting to note that during the Vietnam War, the Lord of the Rings was immensely popular in western society. In a recent article I read, a teacher proclaimed that her students had said they felt clean after reading the Lord of the Rings. The story is indeed built on virtue. And in our own troubled times, the themes and values of Tolkien's world continue to echo and stand. Not only that, the story is set in such a fully developed world where the peoples and characters are astonishingly enriched by a believable history and subsistence, that one feels as if it actually existed. Each race carries their own history and individual characteristics; and the expression of their joys and the weight of their sorrows are brilliantly conveyed through a subtle and elusive style. There is a deep sense in Tolkien's writing of the romance of heroics; where great acts of love and sacrifice can be carried out by the smallest of characters and the truest of heart. So where did it all come from? What inspired this creation and informed Tolkien's writing? Tolkien's style of story telling was bold and different for the times and he himself did not expect the attention it drew. Inspiration and material came from many different sources, but most predominately from Icelandic myth and saga, his love of languages and stories, and his own creative genius. Tolkien discovered a love of fairy stories and adventures from a young age. Couple to this his interest in Icelandic legend and philology and you have the basis and beginnings of his story from an academic point of view. Add in his life experiences, his gift of writing, his religion and his view of life, and you have, in simplicity, the body of Tolkien's writing expression. Heroic romance: yes, but also a story of heroics bounded by morality. But Tolkien's work has drawn criticism from certain sectors of the literary world. The Lord of the Rings has been called escapist, idealistic and lacking in characterization, especially for the women characters. Critics have labelled an apparent lack of grey in Tolkien's black and white, Good versus Evil world, as a deficiency. But in essence this is not true for the style of epic saga writing. In fact, if read properly, many of the main characters display a very realistic and sobering struggle between the Light and Dark of Tolkien's world of Middle-earth; and those characters that 'seem' impervious to temptation, often subtly are tempted, or are set as role models and examples of light in a great saga. Where people tend to become uneasy about the absence of grey in Tolkien's world is in his overall ideology upon which the story is built: Objective Good and Objective Evil. Given the movement in the modern world towards an erroneous relativistic idea of good and evil, [i.e. whatever feels right or true for you is right and true for you etc...] and the denial of an external devil, one can see why this criticism is directed at the Lord of the Rings. The majority feels this objective idea of truth, virtue and evil is no loner realistic in today's world, hence some of the criticism of the novel and the mainstream rejection of the Christian religion. The story champions values and carries themes which by their nature deliver messages [like many stories]. Critically acclaimed stories reflect the reality of our human condition and lead us to contemplate the horrors, or beauty, or complexities of our existence. 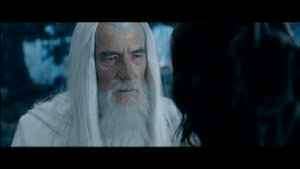 But where the Lord of the Rings is deeper still is that it delivers these themes but provides a Truthful answer. The victory obtained in the Lord of the Rings is brought about by doing what is right, not by doing what is necessary to obtain the victory. In fact, as is shown in the story at multiple points, the quest comes perilously close to failing due to their unswerving obedience and adherence to doing what is right and just and true; and providence wins through in the end. The victory, salvation and ultimate joy and freedom of Middle-earth is wrought through sacrificial love, principally from Frodo and Sam, but also from many of the other characters. This is no new theme, but certainly is an answer for our modern societies and one that deeply touches people. Whether the story is accepted by certain literary scholars is really not important anymore. The story is so well known and loved, especially now as the movies are being released, that the Lord of the Rings is almost guaranteed to continue on in popular acclaim and readership. Tolkien's work has single-handedly brought into life a new genre, Fantasy, from which have sprung many imitations, but none that truly capture the same brilliance and depth and spirituality as the Lord of the Rings. There are many Tolkien experts and scholars who have written much about the ancient legends and myths that the Lord of the Rings has drawn upon but these are not the objects of this discussion, though they will be given some thought. The primary focus of this discussion will look at how Tolkien's faith has influenced his work.